Number 6 on our countdown: the bathroom. That’s my Grams on the wall. She absolutely loved to take baths and primp herself with good smelling lotions, so this poster has been a bathroom-wall mainstay wherever I’ve lived the last 5 years. And yes, that is a globe mug holding the Q-tips. 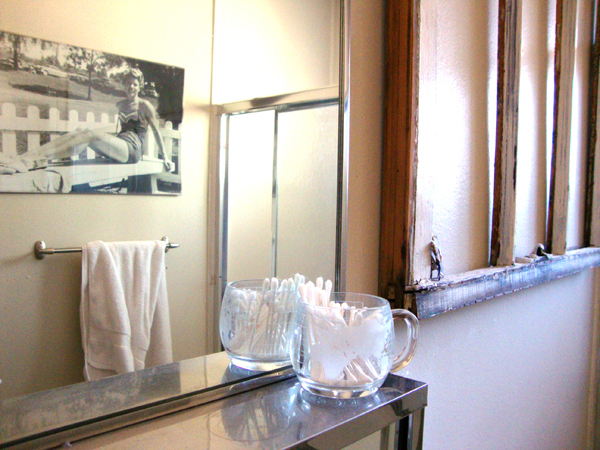 Mama would be sooooo proud to have a place in your bathroom! I can smell the Avon moisturizer as I type! This takes the cake! That picture is awesome. Your grams is adorable.